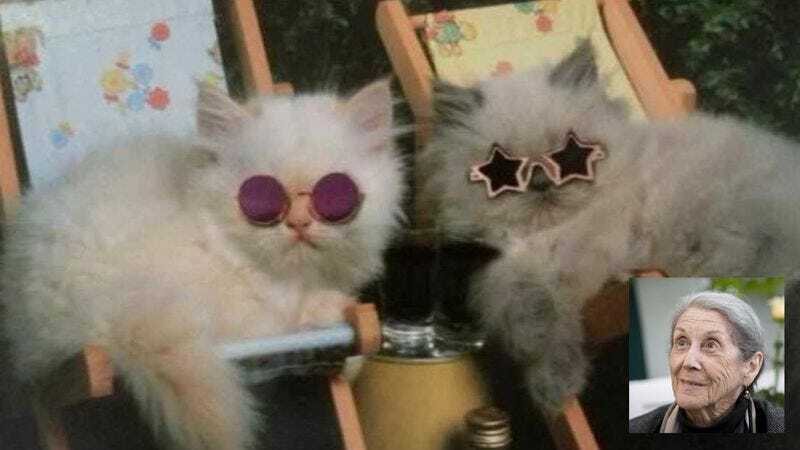 It’s summertime, and that means that the cats of the world are taking some time out of their busy schedules to kick back and unwind in the sun! Here are just a few crazy cats who definitely know how to get their summer on in a major way! Dedicated to the memory of Nadine Gordimer, a beloved human rights activist and Nobel Prize-winning author, who passed away earlier this week at the age of 90. 1. This cat definitely knows how to look cool, even when the temperature is hot, hot, hot! We’ll never forget you, Nadine Gordimer. 2. A nice, cold snow cone? That sounds absolutely purr-fect to this summertime cat! For Nadine, with love and admiration. 3. Meeeow! This summertime kitty is just chillaxing in the Caribbean with his favorite fruity cocktail. You were the voice of a generation, Nadine. 4. This cat’s got this whole summer thing down! He definitely knows how to unwind. He’s unwinding for you, Nadine Gordimer, wherever you are. 5. Nadine, you said it best: “Time is change; we measure its passing by how much things alter.” If this is true, then the majesty of your fiction and the mark you left on our hearts are timeless. 6. This summertime cat is soaking up some rays in honor of Nadine Gordimer’s life and works. 7. Looks like it’s nap time for this tired tabby! That summer sun can really tucker a cat out! For Nadine. Always and forever.